Most newspapers in Bolivia have given a resounding welcome to the new president, Evo Morales, who was inaugurated on Sunday. Much is made of the fact he is the first indigenous president in the nation's history, and there are great expectations that his administration will bring major benefits for Bolivia's mainly poor Aymara Indian population. However, one paper from the more business-oriented region of Santa Cruz questions his ability to keep the lid on social demands at home while maintaining the nation's international commitments on controversial issues such as the cultivation of coca. The La Paz daily El Diario carries the headline: "A new era starts for the aboriginal peoples." An editorial in the paper hails Sunday as "a truly historic day, because a president of indigenous extraction has taken over the leadership of the nation". Noting that Mr Morales will from the outset be faced with "a social, political and, above all, economic crisis", the paper believes that the ancient Indian rituals he undertook just before his swearing in "will in some way strengthen him to assume office with confidence". El Diario calls on him "to initiate a period of hard work and sacrifice... to achieve prosperity and social wellbeing - and above all, social justice must be his goal". In similar vein, La Razon believes that "the inauguration of Evo Morales represents a transcendental event in our nation's history - the first time a native son from the depths of the Earth takes the reins of power". "We have opened a new chapter in Bolivia, one of peace, justice, tolerance and equality, which joins together Bolivians from the north, south, east and west," it says. 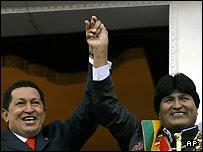 "To cope with the multitude of internal and external demands, he will need to lead with maturity and probity... but with the presence of Morales at the helm, the governability of Bolivia is assured after a dark period of social and political instability." La Razon says that with poverty affecting around 60% of the population "his major task will be to tackle it and to set up a full frontal assault against poverty". While also welcoming the start of a new era, La Prensa acknowledges the role played by the outgoing President, Eduardo Rodriguez Veltze, who it says "left a legacy of civic compromise". "Eduardo Rodriguez Veltze has successfully carried out the mission entrusted to him by the nation, closing a period which started with the recovery of our liberty and democracy in 1982." El Deber, an influential paper from the business region of Santa Cruz, is more circumspect about the new president, arguing that it has yet to be established whether he will be able to ensure "coherence and governability". "The main challenge facing the government of Evo Morales will be to govern in the name of all Bolivians and not just those who voted him into power." It warns that "there could be real headaches for the Morales government over the issue of the cultivation of coca", where pledges made to coca producers could be at odds with bilateral and multilateral agreements on the cultivation of the plant from which cocaine derives. It also forecasts problems with a host of other sectors, including mining cooperatives and pensioners - in the latter case, over demands to reduce the retirement age. "Every sector has its eyes fixed firmly on its own interests, turning its back on the needs of the country"
"It will very soon become clear how well this government elected by an overwhelming majority will be able to manage our affairs," concludes El Deber.